Dr. Reddy receiving his award at the WBJ banquet. 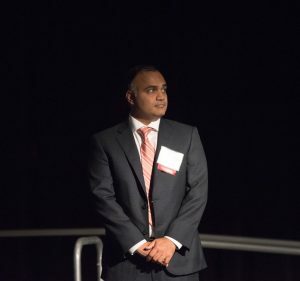 Dr. Pavan Reddy, CCK Physician of 12 years, was honored at the annual Health Care Hero Event on August 3rd hosted by the Wichita Business Journals at the Hyatt Regency of Wichita for Community Outreach. The Business Journals is the industry leader covering business news from a local, regional and national perspective, reaching more than 13 million affluent business decision makers via their websites, mobile, publications and industry events. The Health Care Hero awards are given to individuals who have made an impact on and help improve health care in our community. Dr. Reddy joined the CCK team in 2005 and has since been active in our community in multiple arenas. To mention a few, Dr. Reddy is a Clinical Associate Professor at the University of Kansas School of Medicine, a Principal Investigator of the Wichita NCORP, serves as the Chairman of the Cancer Committee and is Director of Cancer Outreach & Risk Assessment Program at Via Christi Health Systems. We are so proud to have such a well-deserving individual as part of our team of physicians here at CCK.